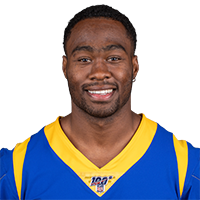 Published: Jan. 20, 2019 at 05:18 p.m.
Los Angeles Rams wide receiver Brandin Cooks dances along sideline for 25-yard catch and run. Published: Dec. 30, 2018 at 05:50 p.m.
Los Angeles Rams wide receiver Brandin Cooks sheds tacklers for an 18-yard touchdown. Published: Dec. 30, 2018 at 04:41 p.m.
Los Angeles Rams quarterback Jared Goff executes a play-action pass to wide receiver Brandin Cooks for a touchdown. Published: Nov. 11, 2018 at 07:18 p.m.
Los Angeles Rams wide receiver Brandin Cooks rushes for a 9-yard touchdown and proceeds to hand the touchdown ball to Floyd Mayweather.